Forest is a large area of land covered with trees, but a forest is much more than just trees, it also includes smaller plants, such as mosses, shrubs, and wildflowers. Forests are home to more than two- thirds of all known land species. Fire is considered a God (the Agni) by Hindus and is used in the performance of most of the rituals. As believed by Hindus and as also preached by Lord Krishna in Bhagwat Gita, fire is one of the five most sacred constituents of life. Fire is one of the most important objects for its multiple uses and upon which the society depends for its well-being. No society can even imagine its existence without the existence of fire. While fire may have been a boon to mankind, it also causes immense losses in the form of life, property and other valuable resources. Forest fires in particular have been harmful to nature as well as society. Fires create the problem of pollution. 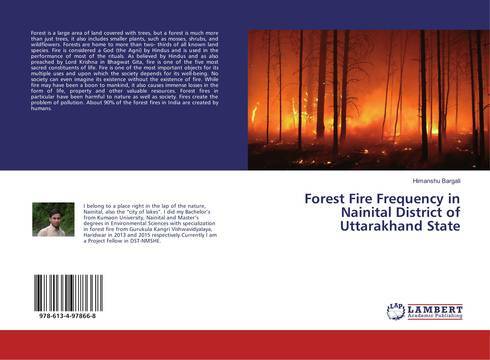 About 90% of the forest fires in India are created by humans.